A recent study on physician plans for adoption of health IT systems found that ARRA and hospital incentives will drive rapid adoption, with 80% of physicians under 55 year of age (and 58% overall) planning to implement an EMR within the next two years. Healthcare Technology News sat down with Greg Parston, the lead researcher and director for Accenture’s Institute for Health and Public Service Value. HTN: This study is focused on the 10 and under physician market in US? HTN: The physicians have pretty aggressive plans. Greg Parston: Because of what’s happening with incentives provided by ARRA and sometimes being provided by hospitals we are at a tipping point. There have been many physicians who appear to have been looking into what EMR can do for them. They’ve been reluctant for many reasons that we identified in the study. But because of these incentives and in part because they can anticipate minor Medicare reductions for non-use, they are becoming more interested. The indications of aggressiveness, if you can call it that, are pretty astounding. 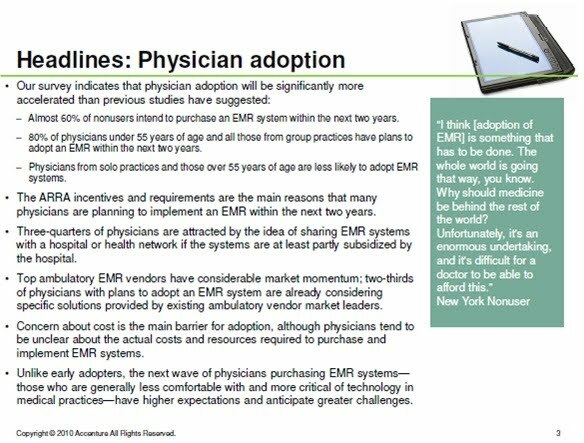 80% of physicians under the age of 55 we talked so say they are going to adopt an EMR system within the next two years and that’s a pretty big shift. Right now we’re talking about a physician population of about 15% using on EMR and now we were talking about much bigger numbers within 24 – 36 months. HTN: There’s always been a prediction that the EMR adoption was right around the corner. Greg Parston: Physicians have been looking. It’s not as if they’re coming to this totally uninformed. Many practices have been taking a look at different kinds of systems. They’ve been considering the benefits. They’ve been talking to people who have a system today. I don’t think they’ve been doing enough of that. But they’ve been doing enough of it to indicate that they been thinking about it. So if we’re talking about 58% now, a good portion of that would have been thinking about adopting it in the coming years. What ARRA has done is to provide the tipping point to make a much larger percentage of small-group practices decide that they're going implement a system. But also because of the deadlines it’s brought their plans closer. You’re right to say that there was a time we thought this was going to happen and there was going to be a big surge. What ARRA has done is to provide the added push and the timetable for that. What’s most interesting is the difference in attitude amongst those physicians under 55 and those over 55. These systems are not inexpensive. For very small packages it’s a sizable amount of money. For the older guys they’re there taking a look at when are these reductions going to come in. How much is it going to cost me? When am I going to retire? Those sorts of questions are making them in some cases perhaps a bit more skeptical of it. More wary of it. More reluctant. When you take a look at the younger guys, 2015 (when the penalties kick in) is still within their working lives. They’re taking a look at how they can avoid any penalties now and put in place a system which potentially has great benefits for them. HTN: Your study cited a key driver for EMR adoption being federal legislation - 61% cited penalties for non-adoption and 51% cited federal incentives. Greg Parston: You can’t just look at their reaction to ARRA. You also have to take a look at their reaction to the potential of local hospital subsidy. Many local hospitals are offering support of one type or another and some of that support is actually financial. There’s also aftercare – we’ve heard of doctors who have had a systems crash and have waited up to three weeks for the geek squad to fix it. Hospitals are offering 24x7 services. Hospitals are offering training. Hospitals are offering assistance in transition from written records to electronic records. All of those things along with ARRA are providing a basket of benefits for clinicians. And while the study does cite the penalty as the single most importat thing, when you combine the benefits of both the government and their potential networked hospitals, these incentives seem to be the overwhelming influence. HTN: The study found a strongly held belief in the value of an EMR system to the practice. The summary in the study was about changing the way the practice works for the better. I hear various arguments: Are the majority of of practices using it just to comply with billing and payment requirements for reporting outcomes? Or are they really into this for better patient care? What is your insight on how this changes the way the practice works for the better? Greg Parston: Patient care came up but it wasn’t the top. What was top was trying to develop more streamlined administrative systems within the practice. And that’s fine. These guys run businesses and they’ve got to make sure that those businesses are giving them the kind of support and administrative ease that allows them to focus on their patients. When we ask doctors who currently have systems whether the systems benefitted them, 90% said they did. There wasn't any one thing that was identified as the overwhelming benefit. Doctors use these systems in various ways for various advantages in various places. Places that have used systems for a very long time like Kaiser Permanente have learned how these systems can not only streamline administrative practices but can also streamline and improve the quality of the patient care process. There are organizations that really know how to use the EMR. I’m not sure that doctors who are in small practices are cognizant of all the potential benefits and changes possible with an EMR system in place. HTN: The study noted the exaggerated perception of the difficulties in using EMR systems. How did that manifest itself? Greg Parston: It manifested itself in the fear and hesitancy about the systems. There is another important observation here that came out of the research. Many of these physicians self-report themselves as being less conversant and less comfortable with computer and Internet technologies than their predecessors. So the first wave who are already using it – the 15% who are already there - they identify themselves as more IT literate. Some develop these systems because they want to be on the edges of modernity. You and I have friends that have every piece of technology around the house because they have to have it. There are doctors like that too. The next generation if we can call it that – the people we were talking in that 58% (or under 55, that 80%), they’re more fearful. They don't feel as comfortable with these technologies. They certainly don't feel able to service it themselves. So they raise bigger questions about how difficult is it going to be implement it or how difficult it’s going to be to get service. Am I going to find that it’s going to crash and am I going to run into real problems in my practice? Those questions don't come from looking at the systems. Those questions come out of their own personal lack of total comfort with new technologies. That’s something that’s going to have to be overcome through learning more and through use of these systems. And here I think that vendors and hospitals that are trying to network doctors in can be of enormous help in providing much more education and support and understanding to make them much more comfortable more quickly. HTN: What was the timing of your survey? Was this pre- December 30, before the meaningful use rules were issued? Greg Parston: Yes it was. It was also right during the height of the health reform legislation. We had been timing this study to occur in the Autumn and we took a judgment about whether or not we should do it during the midst of that debate. We decided we should because people would be even more cognizant and sensitive to the issues. Healthcare reform legislation is going to change American healthcare. HTN: What do you think would be the impact of the meaningful use rules on physicians planning to adopt an EMR? Greg Parston: There’s 600 pages there and I only know one person who’s read all 600 hundred. And they’re still being modified as we speak. Meaningful use is essentially about trying to get people to use the system to full functionality, cognizant that people are concerned about privacy issues and lots of other things. Meaningful use will drive people to take a look at what they get from that next step of functionality. By linking the incentive payment to increased meaningful use physicians will begin to explore more. They’re not going to jump all the way into whatever the top level of meaningful use is simply to get the money. But knowing that the money is there, they’ll begin to explore further the edges of their systems. And they’ll begin to think about how they can use them in a new ways. I’ve already mentioned Kaiser Permanente. There’s a quote in recent article about Kaiser Permanente – about how the system can actually change things - about how doctors will use these technologies to adapt their practices. The quote goes something like this: that if you give a lumberjack, who’s been using an ax his whole life, a chainsaw and he starts hacking at the tree it’s not going to help him. It's only when you begin taking a look at how this chainsaw works and what a difference it can make that it can make a difference in his life. I think that’s the same with an EMR. This is a new technology that’s going to allow people to do lots of different things. Meaningful use is a carrot as well as an instruction about how you can learn how to use the chainsaw in the way it was designed to be used. HTN: You mentioned the striking impact the health reform legislation will have. Greg Parston: It’s going to force people to take a look at what we mean by connected health. I don't mean that in a technology sense. I mean it in the sense of really connecting agencies together to try to deliver value for the public in health terms, not just in health service terms. And that’s pretty exciting to me. This legislation will unleash a whole new part of the market on the demand side. And there are people on the supply side that are very good at innovation and thinking about how they can serve the needs of people who have not been served before. And a lot of that isn’t episodic acute care. I think we could see a very different health system in two decades from what we've got now. What we’ve got now is one that largely focuses on episodic transactional care. I think we can get something which is much more about helping me deal with my health through the continuum of my life. Greg Parston is the director of the Accenture Institute for Health & Public Service Value. Prior to joining Accenture, Dr. Parston was the chairman of the Office for Public Management, a nonprofit organizational development company that he co-founded in 1988 and led as chief executive until 2003. Dr. Parston has consulted widely with top managers, focusing on governance, strategy and change and has worked as a manager in the public, private and not-for-profit sectors. Until taking up his current post, he also was a director of the Priory Group, responsible for public service partnerships.